A group of us headed to Zip Lost Pines near Bastrop, Texas on May 6, 2017. Zip Lost Pines is an interesting use of the available land and an exciting adventure. Make sure you check out the video below to get an idea of the fun. If you are curious about our previous experience Zipling, check out a previous trip to Zipline Lake Travis Adventure. line platforms are close together so there isn’t too much hiking required. Zip Lost Pines is new to the scene and open at the end of 2016 and is located on McKinney Roughs, which is a 1,100-acre park owned by LCRA. The park itself covers multiple ecosystems and has some of the central Texas’ only pine trees. Plus, the Colorado River runs through the park. Our zip tour was at 2:00 pm, and we ended up being around 30 minutes early to account for Austin traffic. Being this early, Linda and I ended up being the first ones there, which gave us plenty of time to sign in, sign waivers, and explore. The facility is new, clean, and climate controlled so you can experience a few more minutes of cool air before heading out on your 3-hour tour. In addition, they are stocked with water, drinks, and snacks if you need something before or after your trip. Finally, everyone showed up, and we ended up on a full tour. Everyone put on their gear, did a short round of standard ziplining training, and we were off to the first zipline. If you have ever zipped before the first line, named Piney Plunge, is a little on the boring side; however, this line is a good for those who are new to ziplining. It is short and slow so you can get a feel for the process. The platform itself isn't too big and the tour good hooks 2 zippers up at once, which adds a decent amount of time to the process. Once the zip is complete, you must hang there a moment while you wait for the guide to use a ladder to get you and your partner down. The second zip, Cactus Corridor, has the tallest platform and a massive spiral staircase. Linda ended up dizzy and feeling horrible after the climb up and unfortunately, her tour ended here. This line is a little longer and a good bit faster, but unlike the name says, I don’t think I spotted any cactus below. Once lowered on the other side, you get the opportunity to walk across 2 rope bridges. There are no gaps in the floor and it’s pretty stable, which made the walk across easy. It’s also a good time to look out at the surrounding area. Valley Vista is the third line at 773 feet, the tour finally gets interesting. This line takes you over one of the area’s deepest valleys, which isn’t very deep. The view down is nice and there is a small creek that runs through it and I think I got a quick glance as I flew by. 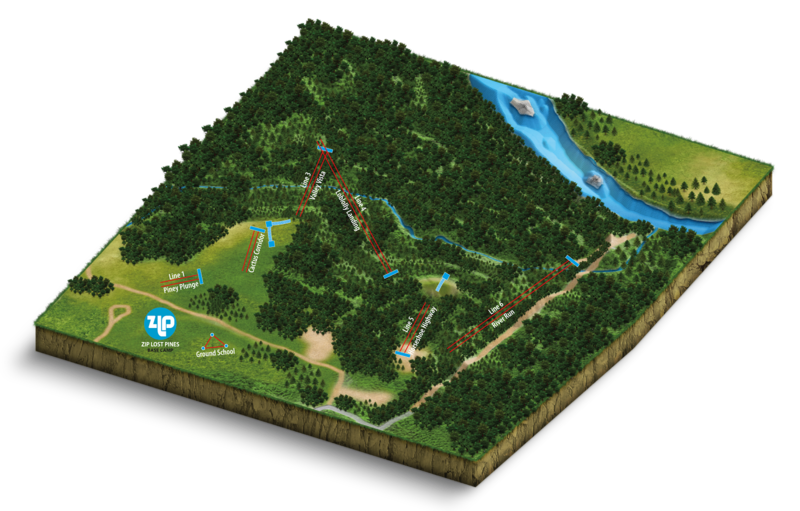 The fourth line is Loblolly Landing, named after the type of pines in the area, at 1074 feet. This line is another spiral staircase and platform, but the view is one the best on the course. There is luscious greenery and you can glimpse the Colorado River. While I was on the platform, eagles were flying overhead and buzzards were just hanging out in nearby trees. Horseshoe Highway is second to last a good bit shorter at 535 feet. This line is interesting because you walk through a large horseshoe for luck and then up a fairly steep rope bridge. No shame in using your hands for help with the walk up; I know I did. And last is River Run 1,316 feet and the longest line at Zip Lost Pines. This line has some of the best views and you end up within walking distance of the Colorado River; however, I was unable to see it from our end point. Overall, it turned out to be a hot but fun day. I definitely recommend trying Zip Lost Pines out at least once, especially if you live in the area. If you watch their Facebook they frequently have themed events. I know I will be back out there as soon as they start night ziplining.